Backpacking Background: I love Appalachian hikes and being in the woods. My preference is for a hike that leads to a stellar view. Kentucky, Tennessee and North Carolina are my usual stomping grounds. I am a mid-weight kind of guy, but increasingly find myself enjoying longer, multi-day hikes and I am conscious about shedding some pack weight, but in a fiscally responsible way. I also climb and prefer clothing that can pull double duty. I purchased my ALPS Mountaineering Lightweight Air Pad (hereafter referred to as pad or sleeping pad) from an online retailer in February 2014. My intent was to do some cold weather camping and I wanted a pad that was thicker than the closed cell foam one I had been using for summer camping. I was also hoping to strike the right balance between cost and weight without sacrificing performance. The pad arrived nicely packed and within minutes I had freed it from its stuff sack and begun my inspection. I was pleased with the feel of the material. The manufacturer lists the top as ripstop nylon and the bottom as polyester taffeta. The topside color is a bluish-gray with a small black diamond pattern and the bottom of the pad is solid black. The black nylon stuff sack felt reasonably sturdy to me and I quickly located the free repair kit and small instruction sheet inside. These items were concealed in an interior pocket sewn to a flap just inside the drawstring opening. The repair kit contained a roughly 2" (5 cm) square piece of material identical to the top of the pad and a small tube of adhesive. 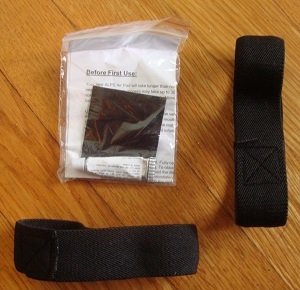 The two black elasticized compression straps measure 1" (2.54 cm) in width. Following the instructions, I turned the valve (non-corrosive brass per the manufacturer) counterclockwise to open, gently unfurled the pad and let it begin to self inflate. The instructions noted the initial inflation may take as long as 30 minutes due to the pad being stored in a compressed state for a lengthy time period. After a half hour, I checked the pad and per the instructions added a few breaths of air to complete the inflation. It took me five healthy puffs before I felt like it was firm enough and then I quickly twisted the valve clockwise to seal it. The valve twists easily and the brass seemed to me like it would be very durable and leakproof. The initial test was performed with the pad directly on a hardwood floor. I am a side sleeper and immediately positioned myself so my hip crest was directly pointed to the floor. My hipbone did not touch the floor. This was exactly what I had hoped. I tossed my sleeping bag on top, slid into it, and tried a variety of positions and the pad felt comfortable to me. I looked forward to getting it into the field. I left the sleeping pad flat and undisturbed for 24 hours and checked it the next day for any signs of leakage. I did not see or feel any difference from the prior day. I measured the pad to the edges of the foam (there is a thin seam of material that extends outward from the pad) and it matched the manufacturer specs on depth, but I found it to be 0.5 in (1.27 cm) shorter on both length and width. This did not bother me. Per the instructions, I again turned the valve counterclockwise to release the air. 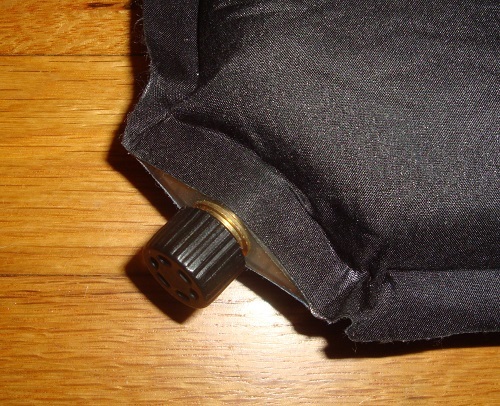 I was easy for me to roll from the bottom towards the valve to force the air out and once at the end I quickly retightened the valve to keep it compressed while I worked it into the stuff sack. The current manufacturer specs list the stuff size as 4.5" x 21" (11.4 cm x 53 cm) for size Regular. The sack enclosed with mine is 6.5" x 21" (16.5 cm x 53 cm). I am not sure about the discrepancy unless they have since changed the sack. 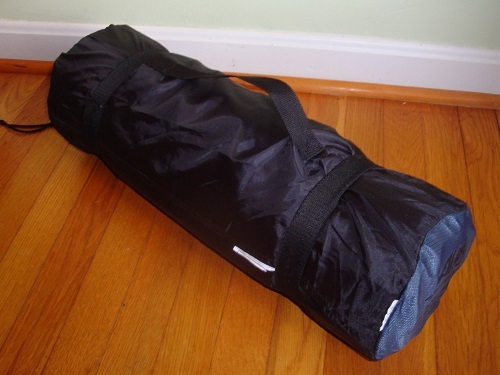 I had no problem rolling it up to fit in the stuff sack provided, but I'm not sure how easily I could roll it down to a much smaller size. The flap pocket that houses the repair kit easily flips across the open end and is secured in place by the drawstring / toggle closure. I could see how this would help block dirt and some moisture from reaching the pad. The manufacturer recommends keeping the pad stored out of the stuff sack with the valve open, but I had an outing planned just a few nights later so I left it in the stuff sack. I have used my sleeping pad about a dozen times since purchasing. It has always been used inside of a tent and never directly on the ground. Sleeping temperatures have ranged from 45 F to 65 F (~7 C to 18 C). I have spent approximately 30 nights on it. I hoped the pad would meet several criteria in the field, but for me, the primary concern was comfort. Sure, my hipbone did not touch the floor during my home trials, but I was curious to see how well the pad held up during a full night's sleep. Other concerns were durability and the size/weight of the pad on the trail. I must say that with regards to comfort I have no complaints. This is a comfortable pad plain and simple. After a few times using it, I quickly learned how many puffs of air to supplement it with for a quality rest. I felt good no matter what position I slept in whether it was on my back, side, or stomach. Also, I didn't find the pad to be as slippery as some that I have used. My sleeping bag generally stayed in place during the night. Durability is a concern for me and I take pride in treating my equipment well. With the exception of the screened ALPS Mountaineering logo on the pad which has worn away some, the pad looks good as new six months later. I have experienced no loss of air, the valve functions smoothly, and the inflation/deflation process is consistent from use to use. Admittedly, this sleeping pad is not as light as I would like it to be. On the trail, I have placed it across the top of my pack under the lid or suspended it from the bottom of my pack with straps. Both placements felt fine and, so far, the stuff sack has proven durable enough to prevent any damage while on the trail. No R value listed. Manufacturer doesn't state R value and I couldn't find it anywhere online. This would be nice to know. A bit heavy for long treks, but I plan to compensate for the additional weight by cutting ounces elsewhere. 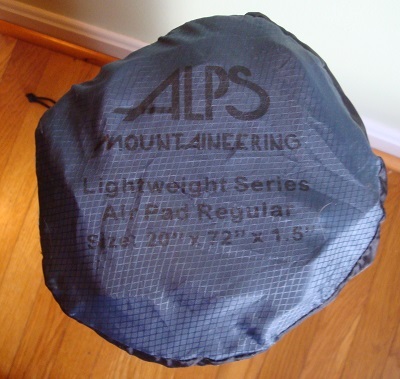 This is a nice self-inflating pad from ALPS Mountaineering. It is comfortable and easy to use. I think the cost and comfort help offset the fact that it is a bit heavier and bulkier than some pads. The pad's material has held up great and I feel like it will last me for several seasons. This report was created with the BackpackGearTest.org Report Writer Version 1. Copyright 2014. All rights reserved.